MUSEUMS IN S. D. G.
The Nor'Wester and Loyalist Museum is located in Williamstown, Ontario beside the Oldest Fair in Ontario, The Williamstown Fair which has celebrated about 190 years of continuous annual operation. The Glengarry Archives is now open in the Sir John Johnson Manor House in Williamstown, Ontario. This link, Glengarry Archives Article is an article put out by the Glengarry Historical Society in their Newsletter in May of 1999 and is included here for informational purposes only. There are 2 Museums in Cornwall, operated by the S.D.G. Historical Society. Contact sdg_historicalsociety@bellnet.ca--- P.O. Box 773, Cornwall, Ontario, K6H 5T5. 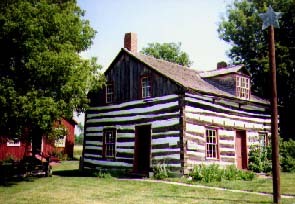 The Wood House Museum is located on 2nd street west opposite the Howard Smith Paper Mill. It is my understanding that plans are in the making to move this Museum to another location. Update 8/00, The Wood House Museum has now been moved to the park south of the Civic Complex between Water Street and the river. photo by Rhoda Ross. Inverarden Regency Cottage Museum is located on the eastern outskirts of Cornwall on highway two just west of Boundary Road and Gray's Creek. 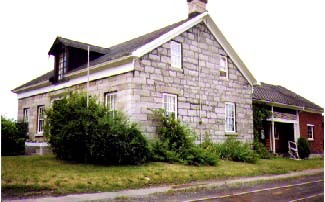 The SDG Historical Society are required to leave Inverarden Regency Cottage Museum by the end of 1999. The Raisin River Heritage Centre. All these Museums operate on their own opening hours schedule. The Nor'Wester and Pioneer Museum and Woodhouse are closed for the winter season. Inverarden may still be opened. More information on Museums will be gathered and added to later on.